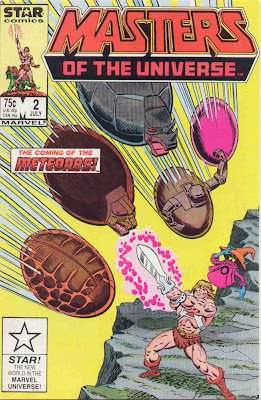 Masters of the Universe #2, “Falling Stars,” was written by Mike Carlin and illustrated by Ron Wilson and Dennis Janke. Here, two factions of living meteors land on Eternia and encounter He-Man and Skeletor. So much for that character-development potential we saw in the first issue; this is little more than a prolonged ad for some bottom-of-the-barrel toys. Man-At-Arms is horrendously out of character – he is, throughout, grumpy, insulting, rash, and oblivious. Nobody else is doing anything development-wise except Orko, who’s learning the same be-careful-and-stop-breaking-things lesson he learned at least a dozen times in the cartoon. This is the third origin of the Rock People that we’ve looked at so far, and it’s inexplicable. They’re all different in terms of what happens in the stories, but they all accomplish the same thing in about the same way. I don’t mind that we’re playing fast and loose with canon for these peripheral characters, but why are we retreading all this old ground? Connecting the Meteorbs – a line of completely unrelated Japanese toys that Mattel licensed – to the Rock People makes sense, but they’re still stupid and pointless. If we’d wanted that stuff, we’d have gone and bought Transformers, which at least didn’t all turn into the exact same useless thing. The art has the same pluses and minuses as the first issue. Half the comic is an overwhelming flood of ovals, laser beams, and action lines, but the artists do a good job with most everything else. He-Man transforms in some kind of weird bodybuilding pose that lets him fit between the other panels on the page. This one is thoroughly substandard and disappointing.